...we recommend you set up your PayPal account as instructed below. These instructions do not apply if you are using PayPal Payflow Pro to process online payments. To avoid product names being incorrectly displayed by PayPal, you need to make sure the language encoding is properly set in your PayPal merchant account. Go to the PayPal website and log into your PayPal account. Click the Profile icon in the upper right corner of the PayPal screen. Within the My Profile screen, click My selling tools (on the left). Click the PayPal button language encoding link at the bottom under More selling tools. Ensure that the setting for Your website’s language is correct. Clicking the Encoding drop down and select the UTF-8 option. Leave the Do you want to use the same encoding for data sent from PayPal to you (e.g., IPN, downloadable logs, emails)? option set to Yes. There are several cases in which you might want to enable multiple payments per invoice ID. Without this option enabled, any existing invoices that use the same invoice number as Wild Apricot invoices will generate an error. There are times when a member may need to pay the same invoice multiple times. After the invoice has already been paid through PayPal, the administrator can modify (increase) the original transaction/invoice amount to reflect new additions the member wants, e.g. the member forgot to include a t-shirt, guest registrations or simply registered for the wrong thing. If the member tries to pay the invoice balance online then PayPal might refuse the additional payment as a duplicate (same invoice ID). In rare cases, enabling this option is a necessary workaround for recurring payments to work with PayPal Payments Pro. Under Getting paid and managing my risks, click Update beside Block payments. In the Block accidental payments section, select No, allow multiple payments per invoice ID. 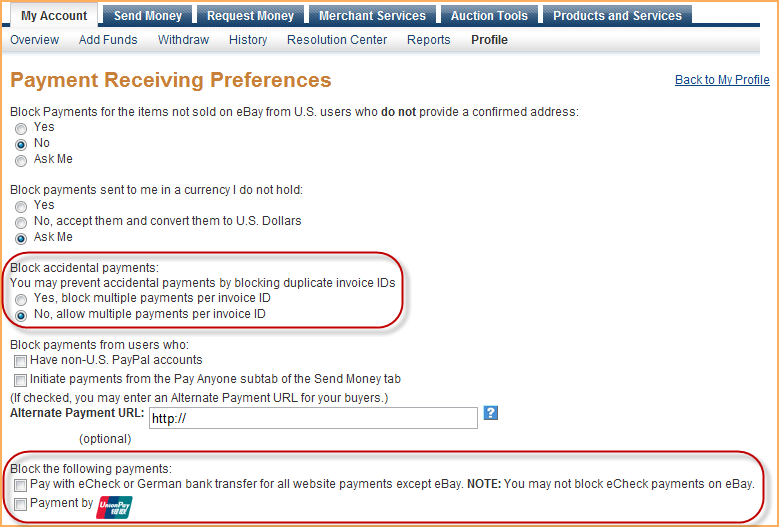 Uncheck the Pay with eCheck transfer for all website payments except eBay option. An eCheck is an electronic funds transfer that withdraws money directly from the payer's bank account. It can take up to nine business days for payments sent by eCheck to clear and the transaction will stay in Pending status during that whole time. With this option enabled, users might get double charged for the same transaction if PayPal is slow to respond and they click the Pay button a second time. We recommend turning off the Encrypted Website Payments option as it might not properly work with Wild Apricot integration (don't worry, this would not affect the security of your account). Click Update beside Website preferences under Selling Online. Under Block Non-encrypted Website Payment, select Off. 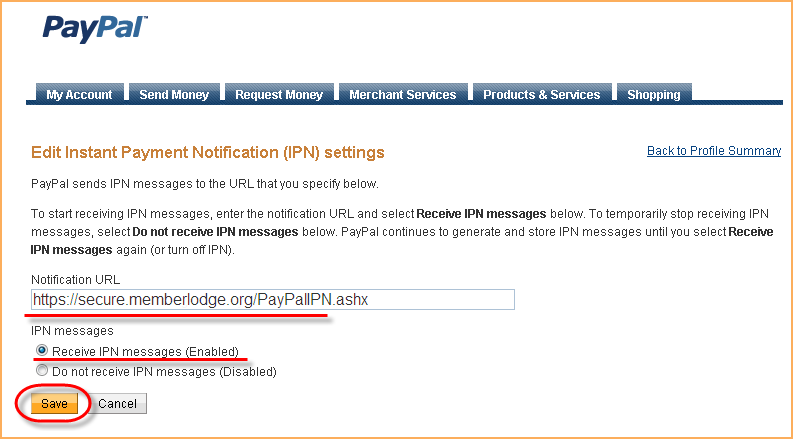 IPN is PayPal's payment message service that sends a notification back to your Wild Apricot account (e.g. payment completed, failed, etc). These messages will always be sent back to your account even if the user closes their browser before they are directed to a confirmation page. Click Update beside Instant payment notifications under Getting paid and managing my risks. Click the Choose IPN settings button. Within your PayPal account, you can control whether credit card payments can be accepted for PayPal Express Checkout, PayPal Payments Standard, and the Express Checkout option within PayPal Payments Pro. 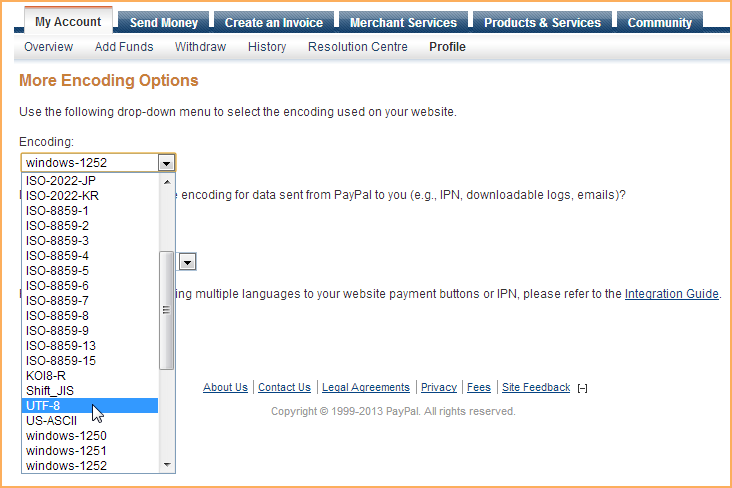 Under PayPal Account Optional, set the option to On to enable credit card payments or to Off to disable them. When you set up Wild Apricot to work with PayPal Payments Standard, you need to enter your PDT token. PDT (Payment Data Transfer) is a secure method to retrieve the details about a PayPal transaction so that you can display them to your customer. 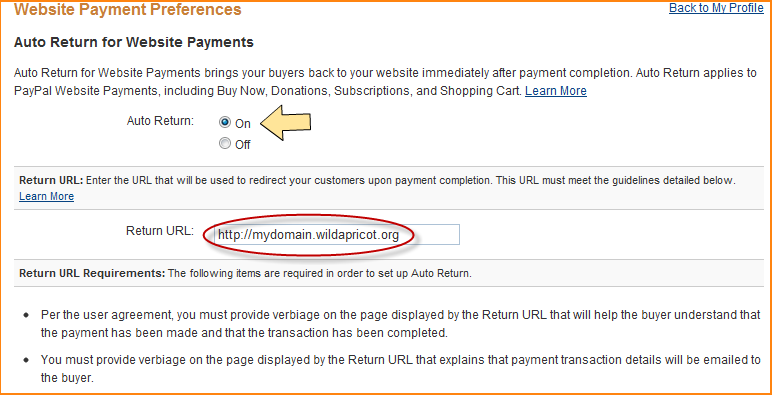 Under Auto Return for Website Payments, enable auto return for payments by switching the option to On from Off. Enter your Wild Apricot site URL in the Return URL field (e.g. http://mydomain.wildapricot.org). Then scroll down to the Payment Data Transfer section and also switch this option to On. The PDT token is now displayed on your profile screen. You can copy the token, then go into your Wild Apricot account under Settings > Finances > Payment settings, and paste it in the PDT token field. To view your PDT token at a later date, return to the Payment Data Transfer section on the Website Payment Preferences screen. Sometimes payments can successfully go through in PayPal but due to some glitch they are not automatically recorded in Wild Apricot. In this case, re-sending the IPN messages from within your PayPal account can help. Click the IPN History page link. Select the IPNs to be resent. Click the Resend Selected button. Only sent and failed IPNs can be resent.